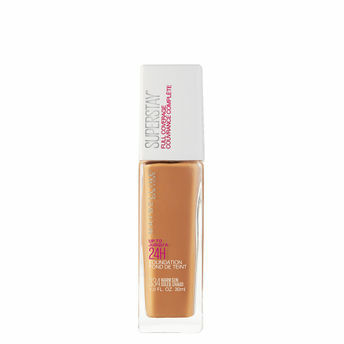 Maybelline New York Super Stay 24H Full coverage Liquid Foundation delivers 24-hour wear for concentrated coverage and a flawless finish that doesn't fade or shift all day. The saturated color pigments provide an ultra-transforming effect while the lightweight, yet high-impact coverage formula glides onto the skin for a flawless makeup finish that lasts all day. Explore the entire range of Foundation available on Nykaa. Shop more Maybelline New York products here.You can browse through the complete world of Maybelline New York Foundation .Alternatively, you can also find many more products from the Maybelline New York Super Stay Full Coverage Foundation range.